Most of Europe left at starting gate for 2014? Articles appearing on Swedish and Finnish official Facebook pages this week suggest that, in Europe at least, the 2014 Women's Rugby World Cup will be as much of a closed shop as the 2010 tournament. Although 2010 was a great success this hid the disturbing fact that, of the near 100 nations that play women's rugby (and the over 50 who have played 15-a-side internationals) only just over 20 were able to compete for one of the 12 places in the tournament. No-one from South America was invited at all, South Africa, USA and Canada were selected to represent their regions without any other teams being given a chance to compete, only Samoa from the Pacific Nations had a chance to play for a place (in a one-off game with Australia) and in Europe only 12 of the continents 36 nations were given an opportunity to compete. With so much longer to prepare this time the hope was that perhaps more countries would be given a chance to make 2014 a truly worldwide competition. But reading between the lines this will not be the case, at least not in Europe. It seems that, while the top eight European nations will be playing for the European Championship next Spring, the next four will be playing on a "European Cup" tournament in Sweden that will - effectively - decide the 5th-8th place seedings for Europe's qualification tournament in 2013. Either the top two teams from the 2013 Six Nations (or maybe the top two teams from the 2012 European Championship) (other than England and France) will also automatically qualify. The remaining four teams from the European Championship will be ranked 1-4 in European Qualifier, with the European Cup teams ranked 5-8. The top two teams from the European Qualifier will also go through. The only outstanding question is who exactly will be playing in next springs two tournaments. The European Championship should include the Six Nations plus the top two ranked teams outside the 6N - which should be Spain and Netherlands. But Finland say that the Netherlands will be in Sweden, along with the hosts, Russia and Finland... so who will the eighth European Championship team be? The next best team in Germany - but the Germans are well behind any of these four nations. Maybe they are hosting the European Championship? Anyway, what this does mean (if it is correct) is that Belgium (who took part in the qualifier in 2009), Switzerland (who made such a successful 15s debut earlier this month), and all of the Balkans and eastern Europe (Russia excepted) are already "out" of 2014 without so much as kicking a ball. Okay, none of these excluded teams would have been likely to have won one of Europe's six WRWC places (assuming Europe does get six again), but that is hardly the point. If the IRB really does want 15-a-side rugby to be anything other than an obscure niche version of the game it needs to at least give these developing nations a chance - but it isn't. It will be no surprise if Switzerland's first test match is also turns out to be their last, or if Belgium stop playing and instead concentrate on sevens. After all - and in stark contrast to all of the above - it was also revealed that every European nations will have a chance to qualify for the 2013 Women's Sevens World Cup. The 24 bottom ranked sevens teams (including Wales and - if they take up the offer - Scotland and Ireland) will compete for four places at next summer's European Qualifier, which will also include the top 12 European nations (including England). The top 12 teams will also play in a Women's European Sevens Series (played over at least two tournaments, maybe three) instead of one "Top 12" competition, as has been the case in past years. So its great news for the continent's sevens players as every nation will have a chance to have a go, rather less good for women who play 15s - unless they live in one of the "lucky" 12 countries. At this stage there is no word from anywhere else in the world about how the remaining non-European places in Paris will be decided, though Australia and New Zealand will get two. That leaves four places for Africa, the Pacific, Asia, North America, South America and the Caribbean. How will they be decided - in an IRB boardroom, or on a rugby pitch? Last weekend's Herts county trials went pretty well by the sounds of it - and congratulations for ex-legends like like Ellah, Jade and Sydney for winning their places in the U18 squad. Unfortunately the news from some other parts of the country is less good. Cheshire have apparently abandoned county rugby for girls altogether - which presumably bars any girls in the county from possible divisional selection as well - unless they make themselves available for neighbouring countries. And Northumberland - a county that used to be a hotbed of the game - can just about get a U15 squad together, while at U18 they can get a team out only if pretty much every player in the county shows up - but "boyfriends, parents, apathy and injuries often get in the way". What is killing girls rugby union in the north? Well, curiously it is not because girls have problems with contact and therefore need to be carefully introduced to the game through some untrialled, ill-thought-out, watered-down U13 game. No - the problem is something first identified on this blog just under three years ago. Rugby League. Whatever you may have to say or think about this unsubtle, watered down version of the game it is not only threatening Union in the north, its beginning to beat it hands down. In the north east six new junior RL teams were formed this year, as well as a girls' performance programme, with two U14s squads - one from Tyne & Wear and the other from County Durham, all linked to a senior ladies team at Peterlee which is taking union players. At the same time "the union side of rugby in Durham has collapsed at U15 with Darlington MP (women's premier league team hosting the current England captain) unable to field an U15's team, while a new Northumberland rugby league team - Whitley Bay Barbarians - is in direct competition with the struggling union team at Whitley Bay Rockcliff". Why is League doing to well? The earlier post covered much of it - a unified sport with money and a clear focus from the top to support the women's game - but the fact is that both tag and the U13 game move much more naturally into League than they do Union. All the things that make Union unique - the game for everyone, the importance of forwards, rucks, mauls, line-outs, proper scrums - are absent from both tag and U13 rugby as they are from League. Look at the basic tactics for tag - this is League, isn't it? And as for U13 rugby - effectively no proper rucks, no real mauls, and when the ball crosses the touchline U13 rugby even restarts with an uncontested scrum - just like rugby league, and certainly not union! Throw in the need for fewer players, more flexible age bands - I am pretty sure that girls can play adult league at 16 - and a game that is based in the north (as opposed to one that barely recognises the existence of a world outside the M25) and its a winning formula that in some parts of England is, well, winning. The problem of bigger, more successful, clubs poaching players is clearly not just an English problem - the French have suffered from it too, but have come up with an interesting solution. It probably would not work in junior rugby (well, not without a bit of tweaking) but for the adult game it seems pretty effective. All registered players in France (they call them "licensed", but it amounts to the same thing) have a "colour". Women who have been playing for less than four years are "orange", players who have been playing for longer - and have also been at the same club for more than four years - are "white", but any player who has moved clubs within the last four years is "white-yellow". There are then strict limits on the number of "white-yellow" and "orange" players a team can field in any league game. A maximum of 7 "white-yellow" in a squad of 22 (6 in a squad of 21, 5 in 20, 4 in 19 - you cannot play with a squad smaller than 19). These limits are carefully policed - last year the champions USA Perpignan were caught, had a win and points taken away, and were also fined €200. Its an interesting idea as it means that large, successful clubs like Perpignan cannot sign up every promising player in their region - thus effectively killing off rival clubs - but instead have to base their game around players who have been at the club for four years or more. To an extent it ensures that talent is spread around as a player wanting to move will steer away from a club with a lot of recent signings. In essence you cannot "buy" success. It can make things difficult for clubs newly promoted to higher divisions, especially if they have relatively small squads, or where a significant number of players retire together (a problem faced by RC Chilly last year), but all in all it seems to work. After Perpignan were caught early last season, no other club suffered similar fines. It would be interesting to speculate how a similar system might work in England, at junior or senior level. At the very least it would encourage clubs to register their players in the first place - and keep the registrations up-to-date! A couple of weeks ago China Daily - the main official news source in China - published a long piece about their women's rugby sevens team. One of the IRB's hand-picked eight teams for Dubai, China are probably the team the rest of the world knows least about - so this article, written shortly after their win in the Shanghai Sevens, was an interesting insight into the Asian champions and their leading player, Fan Wenjuan. It also showed how seriously China is taking women's sevens - an article of this length would not appear about a sport where the country had no serious ambitions. The style of article was, however, full of self-congratulations. "Catch us if you can" the headline shouted. "The Chinese women are miles ahead of their regional rivals" it went on to say "and have the potential to make some serious waves in Rio de Janeiro". However, this article - appearing as it did after only a four-team invitational tournament - rather overlooked China's performance in the last major tournament, the Asia Games, where they lost in the final to Kazakhstan. It was also a bit of a hostage to fortune - and, in their very first tournament, the "regional rivals" have bitten back. The Asia-Pacific Sevens bring together some of the best teams in the two regions. Champions Kazakhstan were absent, as were Pacific Games champions Fiji, but the eight team that did line up on Friday included Pacific Games finalists Samoa, China, Hong Kong and last year's runner-up, Papua New Guinea. China won their group but - for a team "miles ahead" of their rivals - less convincingly than might have been expected, only superior skills with the boot giving them wins against Tonga and Papua. However, fairly comfortable wins over Singapore and Hong Kong saw them through to the final - against Papua this morning. And the news came through an hour or so ago that they had lost - 24-10, so not even that close. What do we conclude from this? First - be careful what you write about how wonderful your team is as it can come back to haunt you very quickly! But more seriously, it seems to show a growing strength in Pacific women's rugby (at least at sevens) - which is significant as its a region totally ignored by the IRB in its women's sevens policy so far. Papua and Samoa did very well this weekend and showed that they are a match for Asia's "best" - but there is one team that neither side was a match for last month and that team was Fiji. Four weeks ago Fiji's women beat Papua 26-0 and Samoa 43-7 - what would they do to China? Or anyone else if they were able to go to Dubai? You do not have to be Dutch to make rugby your profession - a great many women are making rugby their career, as this excellent article hidden away on the BBC's business pages (thanks, Simon!) reveals. Nearly two-thirds of the staff working behind the scenes running the current men's world cup in New Zealand are women, including Therese Walsh, who - as Chief Operating Officer - is in charge of the financial, IT, HR, administrative and commercial areas of the tournament. Its her job to make the tournament a financial success! And its not just in New Zealand. 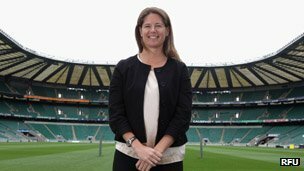 There are women in senior positions at the heart of things at the IRB too, and at the RFU where the Chief Commercial Officer is Sophie Goldschmidt (above right). Its a fairly recent change - the game's senior manager were pretty much all male until 20 or so years ago - but things have changed very quickly, especially as the game has become more of a business. Once the game needed to make money, it seems that managers whose only qualification was to have played the game were replaced. "At every level women bring a different perspective and a different way of looking at issues," says Brent Anderson, former general manager of the All Blacks rugby team and New Zealand Rugby Union. "Women bring a diversity of thought and ideas that can and should make people in rugby stop and think." And although it can be hard at the start for businesswomen to get into the rugby world, adds Mr Anderson, it is up to the sport community to realise the value that diversity of thought actually brings. "Those fresh ideas are likely to lead to good decisions, which will be beneficial for the game." Okay, okay - I am not going to stop! Gosh - that was a heck of a response! Thanks everyone - I am really flattered. I know people read this, but that so many people see this as an important source is gratifying (for me at least. Others may have another view). I really have no intention of stopping this so long as you are reading it, and so long as there is stuff to write about - and, all things considered, it seems unlikely we will run out of that! What I was really just clarifying is that the Letchworth connection with this blog is now really just the title. What is an Under 18? When, exactly, is the cut-off point? Simple enough question, you'd think. Or maybe not. A few years ago this problem was raised in Hertfordshire when we discovered that one of the girls in the county team had a birthday on 1st September. The problem was that RFUW rules say that you have to be "Under 18 on 1st September" to qualify for junior rugby, and if you birthday is the 1st then clearly you are not under 18. However, this was a nonsense. Such girls will still be in school, and if they were boys they would be U18s as the RFU have a much clearer definition - ie. you must be under 18 at midnight on the 31st August/1st September. At the time we appealed, and the girl concerned was allowed to play as a junior. Consider my surprise to learn that this example of bad rule writing is still in the RFUW's books - and girls are still being caught out by it. A parent in the south east contacted me only recently to ask for advice about it as their daughter fell into this trap. Fortunately it now seems that, although the RFUW rule remains in place, officials in Twickenham are in practice applying the RFU's rule instead and - after much confusion and general grief (again) - the girl concerned can now line up with her team-mates again. While it is good that RFUW are behving sensibly over this, it rather begs the question - why not just change the rule? Why do RFUW still have different rules from the RFU over simple matters like age definitions (especially when the RFUW rule is demonstrably bad)? One game, surely - especially now the merger has sort-of happened? I mean, if we have to slavishly follow RFU policy when they get things wrong - things like banning junior players from kicking (even though it damages the female game) and stupid recruitment panics (when it is almost entirely a male issue, if it is actually an issue at all) - then why can we not take on the good stuff as well? Reports from Ugandan rugby sources suggest that the team may be able to travel to next months Africa South sevens after all - and therefore keep alive their World Cup hopes alive. It appears that, with the aid of some cost savings (bringing the target down to around £10,000) plus fundraising efforts, two-thirds of the money needed to send the team to Botswana has already been raised. Another £2500 is still needed for plane tickets, and £1300 for preparation expenses - but with a month to go the team are confident that they'll be able to raise the extra funds needed. A new season has begun, and its time maybe to review where this blog is going. It was originally created as a news system for the players of the Letchworth Girls teams, but that purpose has rather ended. I don't have any real link with the girls teams (well, team - there is just a U15 section this year) now. None of the girls I knew now play for the club - everyone is now too old! - so I get no news about what they are doing - and I am not sure how many of them read this (if any). However, lots of "former legends" do still read this, and it is a great reminder of six or so incredible years we had, starting - as it does - during the second season, and taking in all the triumphs and enormous fun we all had. Every player - certainly from the "originals" - appears in here, somewhere or other. Its packed with memories and so needs to be preserved just for that. The fact that articles from four or five years ago are still being read shows that some people value it, anyway! Its also a great way of letting everyone know about what former legends are doing now, in the rugby careers, and if we are ever going to get that mythical reunion then this is where it would be organised. But more important than that the blog has always been read - and still is read two or three thousand times a month - by many people with no connection with the club at all. The little filler stories have taken over and without doubt what appears on here gets noticed. Quite why I have no idea - why the national governing body would even read a small club blog never ceases to amaze me, but they have always done and (going by the feedback on my reports of the summer's Nations Cup) still do! Reason being, I guess, that communication - true communication (in the sense of a two-way exchange) - within the game in England remains lousy, especially the junior game where even the most basic information tends to be transmitted by rumour as much as anything else. And as for exchange of views - criticism, discussion, debate - there is none of that. There remains a centralised control-freakery when it comes to the domestic game in England that remains astonishing (and no, Julia Hutton, I do not mean you - you are wonderful. My absolute hero. And I mean that - honestly). Coaches, parents and players really are scared to speak their minds, and at least this blog allows them to do that - even anonymously. If I am proud of anything that this blog has achieved it is to hear that it these debates have, from time to time, annoyed those at the centre - at least that means they have had cause to think about what they are doing. Anyone who ever writes a blog (or magazine or newspaper) that a central authority likes should pack it in immediately! Doesn't mean that any policy has ever been changed as a result - indeed from time to time Twickenham has gone out of its way to say how they have not listened to any internet blogs - but I live in hope that it might have had some subliminal influence. Maybe. Yes, at times I get things wrong - almost invariably because of the need to fill some vast unbridged chasm caused by a complete lack of information (again, not your fault JH). It is amazing, but true, that - for example - England autumn tests with France have still not be officially announced (at least in England - they have been an openly discussed fact in France for months), and as for the U13 nonsense... So I guess and speculate and try to make some sense out of smoke-signals emerging from TW2. Better that than silence - and just occasionally it does seem to spark some movement. Mind you, these days its just as likely to be Dublin 2 that raises the ire, though the IRB obviously have more sense than to take any notice of this at all, Indeed is anyone St Stephen's Green knew that this blog existed I'd be ever so slightly worried about them. So... where now? If there were a range of other, real, news sources; if the game was open to discussion and people were not afraid to let their views be known; if the media at large gave the women's game a fraction of the coverage it deserves; if two- to three-thousand people a month were not reading this "irrelevant little blog" (that is the right quote, RW?) then I'd be more than happy to stop. But - apart from ScrumQueens - we are no nearer all that than we were in 2004. A change of name? Ideally, yes - but regular readers know the blogs name, and those that don't find it via subject searches anyway. And it also honours the achievements of greatest bunch of young people you could have ever wished to meet. However, that is not what makes it stand out. What is impressive if the huge red circle to the side there. England. 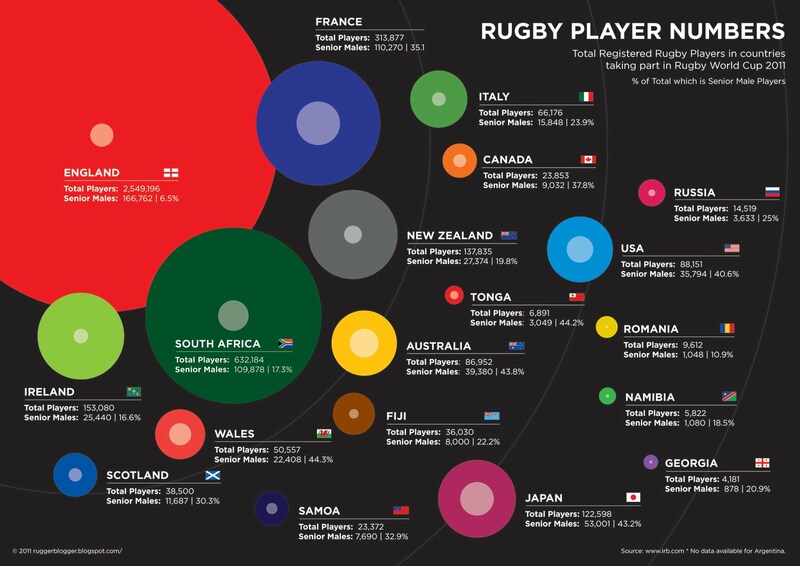 BIG isn't it - shows that England have 2.5 million registered players. Also highlights how many are lost as only 6% are adult males. This is the basis of the panic that has given us U13 girls rugby this season. Yes - of the 2.5 million players in England, 2.4 million are children and women. And we know that RFU wildly undercount women and only acknowledge the existence of about 5,000 adult women players, so almost all are children. Anyone see anything wrong here? No? That is a heck of a lot of children. If I chuck in the fact that the RFU say that only 11,000 are girls then that really is a heck of a lot of boys. Or, to put it another way, there are "only" 50 million people in England, and 10 million are children. That includes babies and infants, so we can also say that there are only about 6-7 million children old enough to play rugby. Half of them are girls, and RFU say only 11,000 of them play. So that leaves us with about 3.5 million boys in England... and the RFU say that 2.4 million of them play rugby. That means that over 68% of boys play rugby union. Wow! And not just at school - this is based on Rugby First, remember. These are club registrations! Does anyone out there, for one tiny moment, believe this? If you do consider this. Letchworth - population 30,000. So that is about 2,000 boys aged 7-18. In which case the club should have 1,300 junior members, or about 100 boys for each age group! What is amazing is such clear and obvious rubbish is never questioned. RFU publish this number, it appears on the IRB database, and now in graphics like this. And no-one ever questions it... And its all fiction. I'd hazard a guess that at least two-thirds of these players do no exist. At least - and if you doubt that ask a school class how many play rugby. How many people would put their hands up? Yet this is the data that RFU use when they panic about players being lost to the game between junior and senior rugby, or about the game not expanding (or even about players being lost). It is this data that is used to justify panics like the U13s. An excellent study appeared today about one of rugby's leading referees - USA's Dana Teagarden. Note that I do not say "female referee" - because it seems wrong to pigeon-hole Dana in that way. Fact is that the IRB calls on her to referee men's international rugby as much as it does women's, so she is clearly one of the leading referees of either gender. What is remarkable - and what I did not realise until I read this - was that Dana began as a member of the USA's world cup winning squad in 1991. I wonder how many other leading officials also have world cup winning medals? Its an excellent and inspiring article - well worth a look. http://networkedblogs.com/n58iM. Women's Sevens Series now set for 2012? "The first IRB sanctioned international seven-a-side tournament for women played in Dubai later this year. It is the first step towards the planned sevens series for women (corresponding to the IRB Sevens World Series) that they intended to begin by early as 2012." Reaction from Netherlands and France to their exclusion from Dubai has been remarkably muted, and this may be the reason. December's event sounds like it is being sold as a one-off trial - with a proper series not starting until next season. Responses also hint that, to qualify for this series (from Europe at least) a nation may have finish in the top two at next year's European Championship. Well, this finally looks like it. Still nothing on the IRB website, but with quotes from IRB Chairman, Bernard Lapasset its the most "official" leak yet. [It's now appeared]. In short, the Dubai Sevens will include an official women's sevens tournament with eight teams whose participation is being part-funded by the IRB. The eight teams are Australia, South Africa, USA, Canada, England, Brazil, China and Spain - so the same teams as appeared in the Brazilian leak last month, except Spain replace New Zealand who presumably refused to take part, despite presumably plenty of IRB pushing which is probably the main reason for the delay. What it is not is a women's series. And that is no surprise as, with no France or Netherlands (to name but two), that would be a hard sell. A one-off tournament they could just about get away with. That aside it is an important development. Australia are taking part at least - for the first time since the 2009 World Cup - and the IRB are part funding it (with the Dubai authorities helping out). However, let's not get carried away here. Only the semi-finals and final will be in the main stadium (which is what has happened at for the past two or three years anyway, albeit with a mixture of official and unofficial teams) so - until it becomes a proper series with all of the world's leading sides taking part - its not so much of a leap forward as a very tentative shuffle in the right direction. First, rather depressing news from Africa that Uganda's women's team - the first Ugandan sporting team of any sort to ever qualify for a World Cup (when they made the finals of the 2009 Sevens World Cup) may be counted out of the 2013 tournament without playing a game. The Ugandan RFU are in deep financial trouble and cannot afford the £13,500 needed to send the team to the Africa South qualifier later this year in Botswana. Tournaments planned for their men's teams are also threatened. Elsewhere the continued silence of the IRB concerning the heavily rumoured Women's Sevens World Series continues.However this is not stopping a fair few countries preparing for it. The first leg would be in Dubai in early December, and from various sources it seems that this will include - as a minimum - USA, Canada, France, Brazil, England and Netherlands, plus suggestions that we might even see teams like Australia, New Zealand, South Africa and China taking part. The second and third legs - in Las Vegas and Hong Kong - are also firmly on the calendar of most of these nations, which rather implies a pretty strong unofficial Series even if the IRB cannot bring themselves to make it official. The only problem seems to be the fourth leg. French plans (below) show that a tournament in London was being planned - a major first for women's sevens as there has never been an international women's tournament in the UK before - but clearly there are some problems, problems that may be behind IRB's delayed announcement. It is interesting that France were targeting Amsterdam instead if London falls through, but it would be deeply embarrassing for the RFUW and RFU if the world tour went there instead of London. IRB want Australia and New Zealand (and China maybe) to take part - but they will probably not commit. An eight nation event would be financially viable, but more than that might be problematic - the more teams you have in a tournament the more matches you need to play, and the more stadium time is needed, so costs rise significantly. In some venues you'd need extra pitches. Trouble is that eight teams means excluding teams like France, Netherlands, Spain, etc. IRB may not normally worry about such things, but now the Olympics are involved many of these nations' NOCs will be very interested and will have the financial clout to to sue the pants off the IRB if their nation was excluded. The IOC itself would probably have things to say. With the money the Dutch are investing into their Sevens a few extra Euros to brief m'learned counsel would seem a reasonable expense, especially if joined by France, Spain, et al. Its difficult to see how the IRB could argue successfully, in court, that the likes of France (finalists in last Hong Kong 7s) and Spain (Euro Champs 2010) should be excluded while New Zealand and Australia (not set foot on a field in 7s since 2009) should be included. What I suspect we are going to get therefore is... nothing. Well, nothing other than Dubai, Las Vegas and Hong Kong having far larger turnouts of women's teams than ever before - but no overall, official, WSS title. And no London sevens. RFUW have made no announcement about this, other then the anonymous official who posted on here during the Nations Cup, but England will be playing to friendlies against France this autumn ahead of the New Zealand tour. There could be an international women's sevens in London on 12-13 May, which would presumably be the fourth leg of the much-rumoured (but still unannounced) Women's World Series. One of the puzzles of women's rugby is why France - the country that could reasonably claim to be the birthplace of the women's game - under performs, when compared with other major nations. Overseas tours are few, and - despite being part of the FFR for two decades - those running the game seem to lack the ambition of the country they seem to envy more than any other - England. She played, unfortunately! We were devastated in the family. She was wrong, obviously. Rugby has been in our home for a long time, but to do the same as her brothers, it was not appropriate for her personally. Once we get a little scratch in in women's rugby, we become all macho. Anyway, I think there are other sports for women. I suppose the best you can say about this is that at least he is honest. However, can you imagine Martin Johnson saying anything similar? That he should think he could say such things without being slapped down by the FFR perhaps shows that his patronising attitude is by no means unique in French rugby. Estelle Sartini, former French captain and a member of the Steering Committee of the FFR, was unimpressed - "I know that unfortunately still a lot of people who think like this." though she hopes that "the inclusion of the women's rugby at the Olympics will be one way that attitudes to legitimacy of the sport will change." A reminder - for those who have not come across it before - about Sportsister - the only UK magazine dedicated to women's sport. The magazine frequently include articles about women's rugby and general articles about fitness, diet, training equipment and kit, plus information about a wide range of other women's and girls' sport. In fact, everything that the male-dominated sports media ignores! The website is an excellent information source on its own, but there is also the printed magazine which is amazingly cheap - £10 for six issues, including postage (and, at the moment, a free gift worth twice the subscription cost). The 56th women's rugby test team took the field for the first times today - and made a winning start. Switzerland - not a country you'd associate with rugby - travelled to Belgium... and came away 15-7 winners. They have actually been playing for some years - especially sevens - so its not a total surprise, but this was the first time they had played another country's national team. And, as Belgium would be ranked at around number 20 in a world list, it is certainly a good start. They are unlikely to feature too much when it comes to the 2014 World Cup, but might aim for a place in the European Championship in the near future. On this performance they'd certainly give the likes of Finland and Germany a game. Sydney on the road to Rio? It may be rugby sign-up weekend for most juniors, but for one the season has already started (as if last season ever finished). Sydney Gregson will be playing for the London & South East U18 sevens team this weekend in the UK School Games in Sheffield. This is the first time rugby sevens has been part of the games, and is one of England's first steps towards getting together a GB team for the 2016 Olympics in Rio. What is amazing about Syd is not only that she has been selected as one of only ten girls from the whole Division, but this will be her first taste of U18 rugby - last season she was only a U15 so she has never played at this age band before. The selectors clearly must think a lot of her! There will be six teams in the competition, which is being played in Sheffield - the four English Divisions, plus two Welsh teams. The only disappointing thing is that this will be the last time Sydney runs onto a field as a Letchworth player as, due to the lack of a U18 team at the club this year, she will have to move to Welwyn this season. However, despite the change of club colours, once a "legend" always a legend!